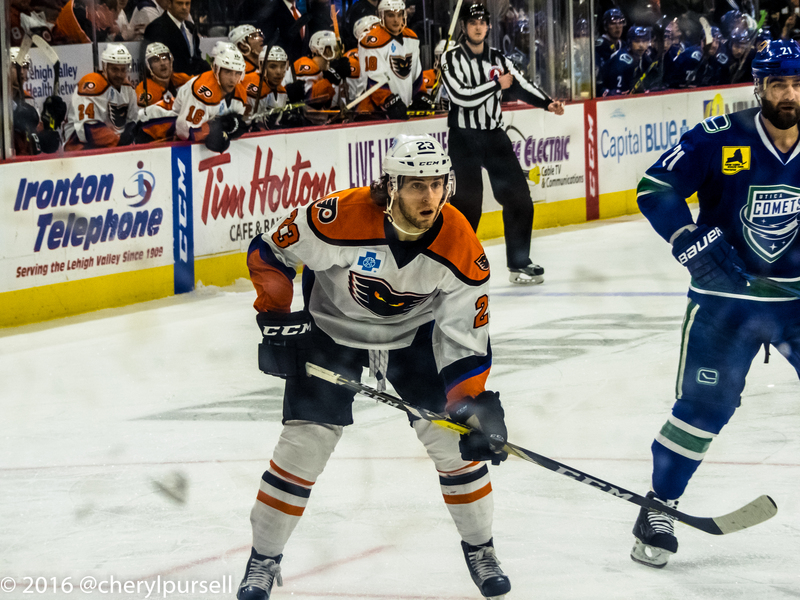 The Phantoms left town last Saturday night on a losing note after getting man-handled by the bigger, stronger, faster, and better-at-hockey Utica Comets. The 2-1 final was a bit misleading as the Comets out-shot the Phantoms 42-22–and it wasn’t that close. Only a yeoman’s effort by goalie Anthony Stolarz–starting his sixth game in a row–kept the game within reach. With several players battling flu-like symptoms (There is and was no confirmation that it was actually the influenza virus or which type it was–but then, when do we ever get accurate medical information from the team, anyway? It easily could have been another virus, causing similar symptoms. Also, the folks using the word “flu” probably don’t have a medical degree) the team limped its way up to Hartford and managed a 2-1 win. Reports from those in attendance in Hartford were impressive: A team clinging to its last post-season hopes was able to grind out a 2-1 win once again coming from behind in the third period. They got goals from Taylor Leier and Kevin Goumas. They didn’t have their best lineup on the ice, Hartford was rested from having Saturday night off, but the Phantoms still managed the win despite getting out-shot 25-23. Stolie isn’t perfect, but he started his seventh straight game and got the win. Should the Phantoms find a way into the playoffs, you might want to circle this game as a turning point of sorts. After a second-straight 3/3 weekend, the Phantoms had a mid-week game up in Syracuse on Wednesday. The Hamilton Street Zeros Heroes decided it might be a good game to give the defense a break. Stolie had other ideas. 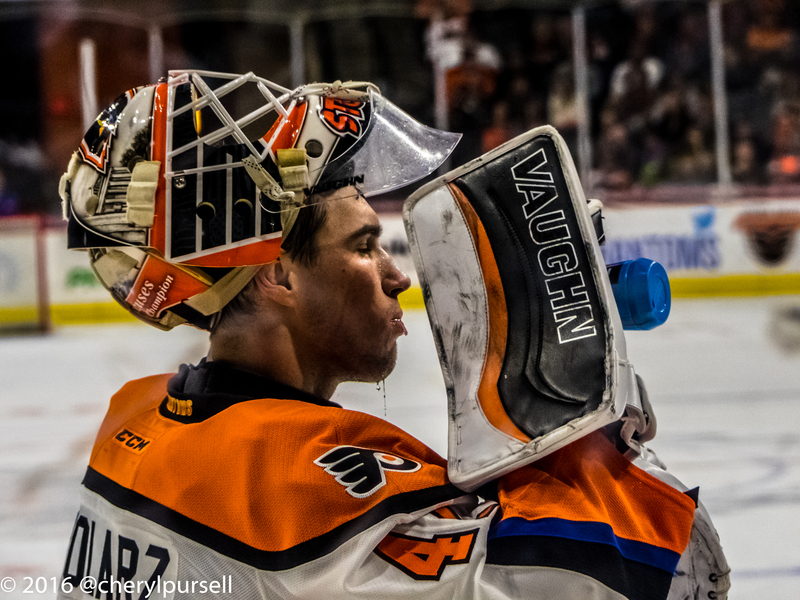 The second-year netminder turned away 51 of 53 shots, setting a new Phantoms record, this in his eighth straight start. 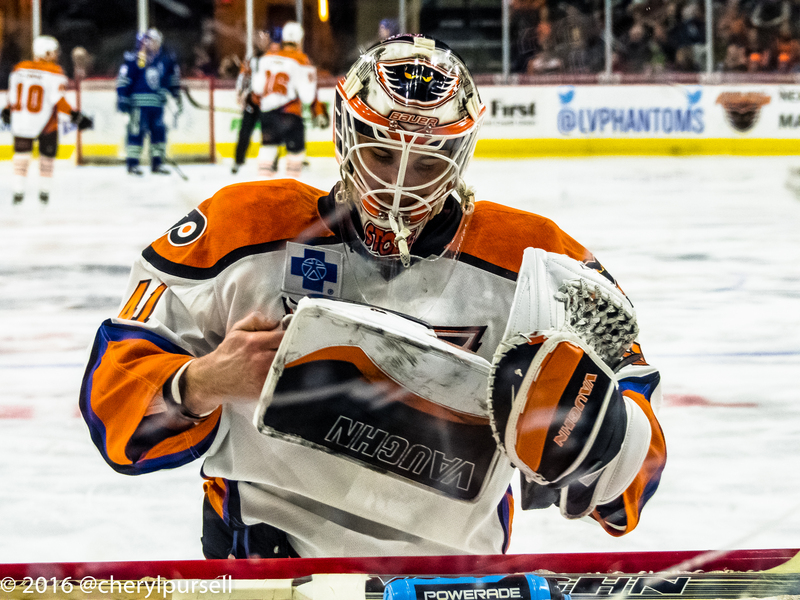 He also blanked the Crunch in “crunch time” during the shootout, as the Phantoms took the two much-needed standings points from the North Division opponent. Goals in the game by the “Mighty Mites” Bardreau and Martel. Lamarche was a +2 in the game, and Colin McDonald lead in shots. Of course, Stolie was the #1 star of the game. 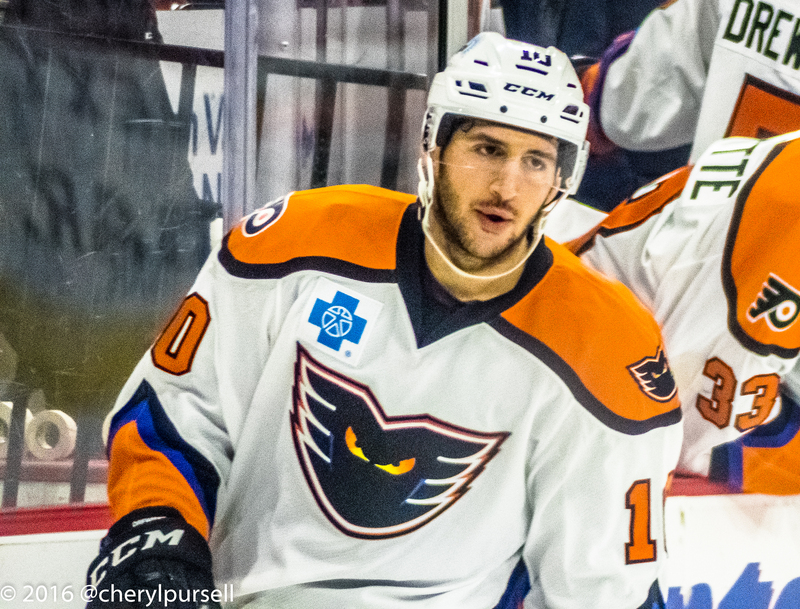 Using our original formula, I now have the Phantoms needing 14-3-1 over the last 18 games. Bridgeport holds the final playoff spot, five points above us with a game in hand. We also have to pass Hartford on the way, and make sure St John in the North doesn’t go on some kind of similar run. *The Phantoms “magic number” of 44 points to clinch reduces by 2 every time we win, as well as every time the team we’re chasing loses. With 29 points in my above assumption, that leaves 15 points worth of losses for Bridgeport. With 19 remaining games, they must lose 8, or go about 11-8 in other words. This isn’t completely un-doable, and of course those pesky OT/SO losses are a way to gather points–for each team. As d.E. says, .500 isn’t really .500 any more. Whichever way, we need to gain those 5 points on the Sound Kitties. Bridgeport has four games versus WB-Scranton and Hershey in its remaining schedule, where we must cheer for our division rivals. If we can last that long, we get to play them head-to-head in a home-and-home April 9th and 10th. Whatever. I say we “go for it!” I’m starting my playoff beard NOW. As the team bused up to Hartford last Sunday, diminutive defenseman (and Horn and Bell favorite) Jesper Pettersson was summoned from Reading (while playing in Glens Falls versus Adirondack) to help support the ailing blue line. He started alongside veteran Davis Drewiske. He has since returned to Reading. Long-injured forward Kevin Sundher is back in practice, although skating non-contact on Tuesday, per media reports. G Jason LaBarbera has been unavailable of late. At first he was nursing some nagging injuries and manning the bench as Stolie assumed the full-time starters role. Then, somewhat freakishly, he was hit in the hand with the puck during last Friday’s game. 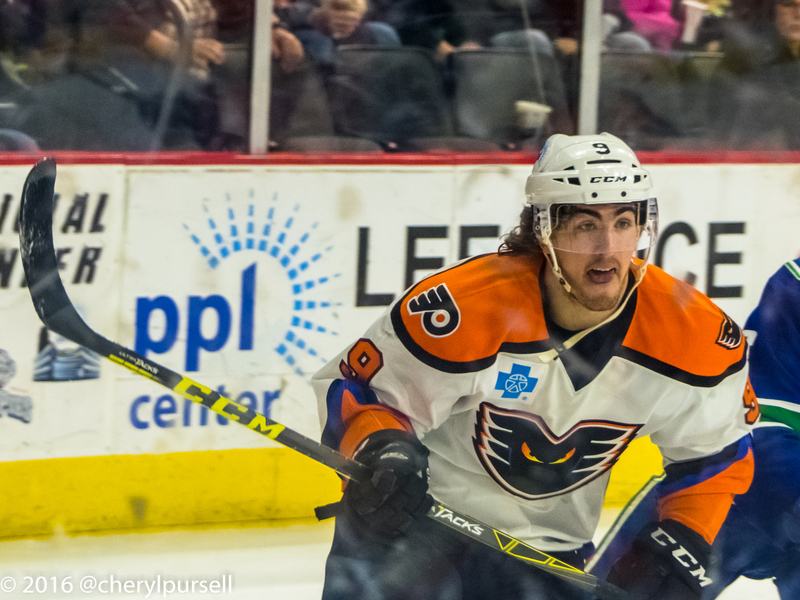 Martin Ouellette was recalled from Reading to support Stolie. G Anthony Stolarz has started 8 straight games. They were 2-1 on the three-game road-trip. They’ve got Wheeling (Pittsburgh) tonight and tomorrow night at the Salamander, and Norfolk on Sunday for a three-game home stand. If the playoffs started today (they don’t) the Royals would have the 7th seed. They’re three points behind 6th seed Atlanta, and five points ahead of the first non-playoff seed. Guess who? Wheeling. Go Royals! Important pair for them tonight and tomorrow. Before reading the scouting report, check out this fight video. I have Morin losing 10-9 this round on my card, but could a rematch be in order tonight if Sestito gets a sweater tonight? Tickets and Parking: Tickets are extremely limited: singles and SRO at this point. Seats are plentiful on the secondary market. I would advise that you procure your dockets before heading downtown. Pre-purchase arena-deck parking HERE while supplies last. Otherwise, use Parking Authority inventory, which has been plentiful. Broadcast Information: If you’re unable to make it to the game, you can watch at home on Service Electric TV-2. Promotion: Poster Night #4: It’s our fourth and final throwback night featuring a poster giveaway commemorating 20 years of Phantoms Hockey. THE JERSEYS WILL NOT BE AUCTIONED TONIGHT. The auction of the throwback sweaters will occur on eBay at a later date. I would also watch that silent auction table, as they’ve been running a bit thin on their offerings lately and a bolus of gorgeous sweaters could put them back in business. Concessions: The PPL Center has a variety of meatless options for those observing Lent. 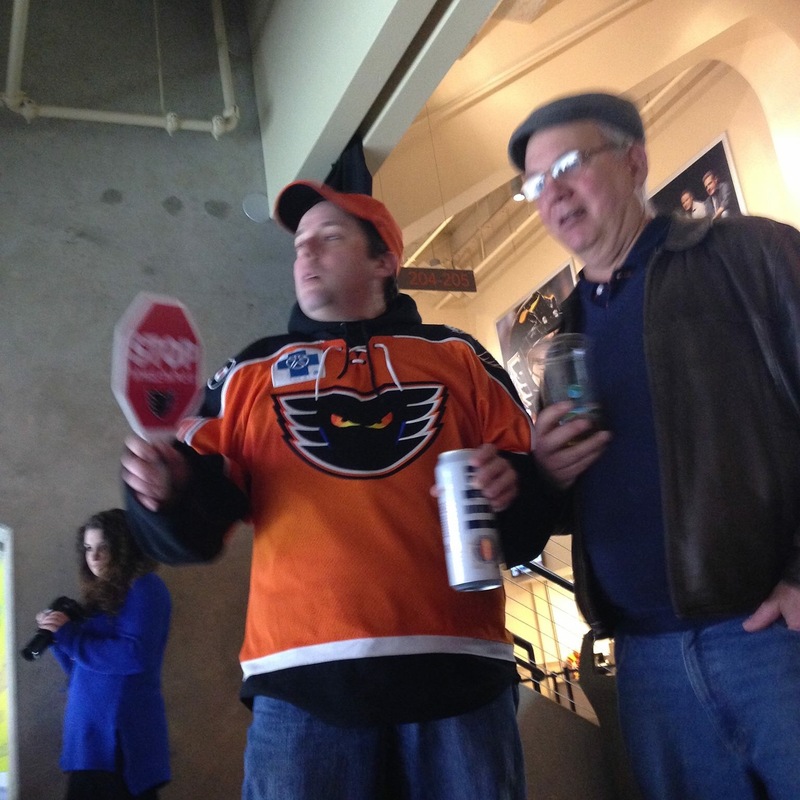 Hometown Hero: A quick word: This has become a PPL Center/Phantoms tradition and I think it’s great. Most of us stand and clap. I remove my hat. Some don’t stand or clap. Internet shaming, yelling, or starting a fight with those ignorant individuals does nothing to honor the man or woman being featured. In fact, it detracts from their moment as their accomplishments are read over the P.A. Don’t bother with it. When/if those lazy folks sitting become real fans, they’ll learn what to do. And yes, a small few of them may have a disability that prevents them from standing. Perhaps even a service-connected disability. One more thing: the “Hometown Hero” has a sponsor–First Generation. That means money is changing hands. Where does it go? How much? Are the Phantoms making money on this? Was it thrown in with their PK sponsorship? Or, does it go to the charity arm? Is it more than the cost of the free jersey that the hero gets? Does he/she get free tickets to the game? If so, that’s great, but enough for all of their friends and family to come and see the honor without forcing them to buy tickets? Is this a group-sales opportunity as well? Make no mistake, I think it’s great that we’ve made this an every-game honor in our building, but I’d like to keep the focus on the men and women who served, and not on the lazy and ignorant who remain seated. Their service is something that I’ve never done and could never do. I like it so much that I’ll choose to ignore the fact that the Phantoms are probably making money on it every single time. I’m sorry for getting off on a rant. Pregame: TV pre-game tonight will feature a sit-down with Stolie, plus a feature on the line partnership of Taylor Leier and Chris Conner. Catch it at 6:30PM at home, or live at Chickie’s and Pete’s before the game. Went to check out Hook before the game last Saturday. I had a great meal–some lobster and steak and not the most I’ve spent on a pre-game meal. We’ll check them out again soon! Also watch to see if LaBarbera is healthy enough to back-up Stolie. Both he and Ouellette are still in town as of this writing. Watch that line with Conner and Leier. They are playing very well together and Connor has an points in 17 of the last 19 games. Watch Martel and Bardreau. As I’ve said before, these young guys are playing well and improving before our eyes. No, we’re not talking superstars, but good, tough, hockey players with a lot of ‘want-to.’ It’s fun to watch. Watch to see if Dalton Smith gets a sweater again. He played his first game for the Phantoms up in Syracuse. However, I wouldn’t be surprised to see the phantoms go 11F/7D against the Penguins. Watch out for fights. We’ve seen this team enough, perhaps some of the season’s frustrations–on either side–might come out tonight. Round two of the big guys, Morin and Sestito? As the preview suggests, the Pens aren’t playing their best hockey right now–but they love playing in downtown Allentown. How will that play out tonight? Watch the Penguins. They’ve got two with Hershey tomorrow and Sunday, and despite their superb record in our building, they could be overlooking us in order to try to beat the Browns and regain the top spot in the division. How’s their chemistry after re-loading at the deadline? With those givens, watch to see which team seems to want it more tonight! That’s it for hockey nights for a while: The Phantoms take to the road (not necessarily a bad thing if you look at their home/away splits) for the next five games. 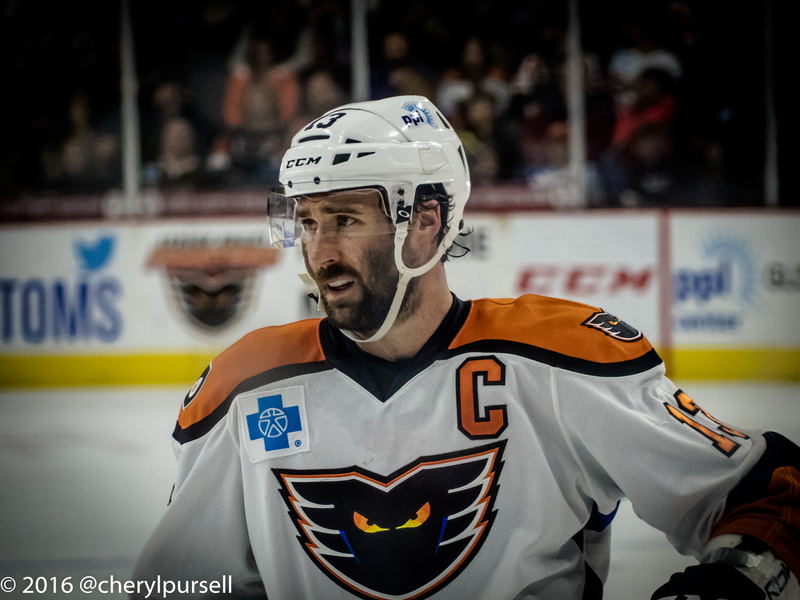 The Phantoms return on Sunday March 20, for a 5:05PM face. Post-game autographs are planned.